Need an experienced, provocative & influential telecoms keynote speaker, moderator/chair or workshop facilitator? I recently gave a keynote speech at the Wi-Fi Now conference in Shanghai (link), which was co-located with the Wi-Fi Alliance's Asia regional members' meeting. My presentation (link) covered the forthcoming opportunities and challenges for Wi-Fi technology and solutions. The position of Wi-Fi in the home is extremely strong. The growth of whole-home Wi-Fi using extenders and mesh-network technology, cloud management platforms and the imminent arrival of Wi-Fi6 (formerly 802.11ax) for more capacity and performance, gives it an unassailable lead for most domestic applications and devices. 4G and 5G pose almost no threat to Wi-Fi dominance in the home. While smartphone users may spend slightly more time on cellular if they have large/unlimited data plans, this is more than offset by greater use of Wi-Fi-only devices (TVs, PCs, smart speakers & other IoT products). Few homes or people will go smartphone-only, especially in developed economies. Furthermore, cellular networks lack the in-home positioning and intelligence layer of newer Wi-Fi solutions. Fixed-wireless 5G will almost always need Wi-Fi inside, connected to an external/window antenna. Even in the (few) places 5G FWA can substitute for fixed/cable broadband, it will still mostly deliver last-metre connections via Wi-Fi. A small number of future consumer IoT devices may have "direct to cellular" connections, but these will be the minority, typically restricted to out-of-home products like pet trackers or smart watches. 5G/eSIM-based PCs, wearables & tablets will remain a tiny % of the total device universe. Don't expect 5G-enabled TVs or 4G/NB-IoT washing machines. For low-power smart home products, alternative connections like Bluetooth and ZigBee will remain important - not everything can use Wi-Fi. There might be some LPWAN devices using SigFox, LoRa or perhap Wi-Fi's own HaLow technology, although that is still moving only slowly. In "carpeted enterprise" offices, Wi-Fi will remain critical for many users, alongside wired ethernet for desktops, servers and other non-moving equipment. 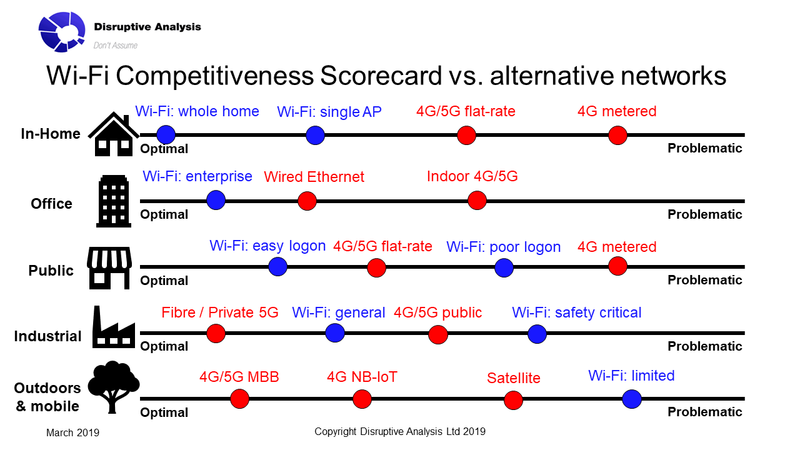 While there will be a growing need for better indoor 4G/5G coverage (especially in higher frequencies), that cannot replace normal LAN technology. Users will expect both Wi-Fi and cellular to have reliable indoor coverage, capacity and security. The Venn diagram of use-cases only has a narrow overlap. That said, delivering good Wi-Fi indoors is not easy - and like cellular, it will need more "deep fibre", especially for higher frequency bands in future, like 6GHz or 60GHz. Industrial Wi-Fi faces more challenges. While for many applications, industrial-grade Wi-Fi and meshes is widely used, the growth of IoT, robotics and realtime automation/cloud will start to make wireless connectivity more business-critical, and in some cases safety-critical. Unlicensed spectrum, and limited coverage/mobility support may make Wi-Fi's role prone to substitution by public and private 4G/5G networks in some cases. There appears to be more work being done to make spectrum available, as well as integrate with manufacturing / process machinery on the cellular side. There doesn't appear to be as much of a cohesive ecosystem - I don't see a Wi-Fi equivalent of the 5G Alliance for Connected Industries and Automation, for instance. Limited focus on verticals and testbeds. While I'm skeptical of mobile operators' roles in pushing 5G solutions on various sectors, there is no doubt that the cellular industry is working hard. There are countless "5G for Sector X" associations and collaborations, multiple university and government 5G research institutes, and promotional efforts galore. Why is there no equivalent "University of ABC Wi-Fi Innovation Lab", of "Wi-Fi Healthcare Alliance", where vendors and developers can experiment with new use-cases and create more public "buzz"? The industry - and its major vendors - need to step up and increase funding for this sort of thing. Broadcom, Qualcomm, Cisco, Google, Intel, HPE, Amazon, Arris etc - I'm looking at you. Public Wi-Fi faces growing risks. While I'm writing this article on my laptop in a cafe, most of my fellow coffee-drinkers are using smartphones. This location has a simple one-click access to Wi-Fi, but other places often have crass and privacy-invasive attempts to "monetise" Wi-Fi, with extra login personal data demanded, or attempts to get users to connect with FB or Twitter accounts. The growing number of large/unlimited data-plans, coupled to reduced roaming fees for travellers, and even tethering for PCs, makes the relative pain of accessing 4G vs. public Wi-Fi very different to a few years ago. Venues wouldn't force people to give email addresses or social logins to use amenities like elevators or bathroooms; they shouldn't for Wi-Fi either. The industry should campaign against cumbersome logins. It doesn't need full automation like PassPoint or HotSpot 2.0 - just "frictionless" access. One click on a splash-screen is fine. The Wi-Fi brand is over-protected. Technically, Wi-Fi is a brand that can only be used by products or SPs that get certification from Wi-Fi Alliance. The technology is based on IEEE 802.11 standards. While the guarantee of interoperabilty and "it works anywhere" is great, this poses a problem. There's a lot of cool stuff being done with 802.11 that isn't standardised and fully certified. I've seen licensed-spectrum versions (potentially more suitable for industrial markets). There's some great innovation with 60GHz 802.11, formerly called WiGig. Some vendors have proprietary tweaks, like Blu Wireless allowing gigabit transmission to fast-moving vehicles with handoffs in the UK AutoAir testbed (link). These innovators can't use the term "Wi-Fi", so instead they call their products "5G", adding to the noise and hype - and its impact on regulators and policymakers who then think that 5G deserves special treatment (and spectrum). In my view, the Wi-Fi industry is undermining its own importance, especially if they want to create a case for 6GHz, or other future bands. Most people in politics don't grasp Wi-Fi's level of economic and societal contributions, so to me this seems to be an own-goal. Maybe WFA should create a new category called something like Wi-FiX for "experimental" technologies to capture this extra goodwill. Wi-Fi combines well with other technologies. I'm seeing a growing amount of important intersections between Wi-Fi and other domains. AI, for instance, is being used to manage Wi-Fi fleets by major service providers, as well as cloud companies. Juniper just acquired Mist Systems for its AI-enhanced Wi-Fi solution (link). It's being integrated with both consumer and enterprise IoT. Amazon just acquired eero, a home mesh-Wi-Fi specialist. I'd be unsurprised to see some sort of Alexa-eero hybrids in future (link). And I've written before about the Wi-Fi + blockchain opportunities, including those of my friends at AmmbrTech (link) and assorted others. There's some cool stuff using Wi-Fi for motion-detection as well. The Wi-Fi industry needs to be emphatic - and fast - about creating versions designed to work in all spectrum bands, licensed, unlicensed and shared. There are use-cases for all of these, especially with moves to opening up CBRS and c-Band for more innovative use-cases. We see cellular technologies adopting unlicensed variants like 4G-LAA and MulteFire. Wi-Fi should make the opposite & equivalent move. Yes, 5G and Wi-Fi will work together. Absoutely, I see many reasons to integrate 4G, 5G and Wi-Fi in various guises, both at a network level and service level. We will see MNOs that have big Wi-Fi footprints. We'll see 5G FWA with Wi-Fi indoors. We see dual-connected home broadband gateways with both fibre and cellular modems. We have offload, onload, Wi-Fi first MVNOs, Wi-Fi calling and and non-3GPP access to 4G and 5G core networks. This trend will continue. Yet I still see ignorant references to Wi-Fi being "part of 5G", or "killed by 5G". It is neither; sometimes the technologies will be complementary, and sometimes competitive or substitutive. But in all cases, they compete for the oxygen of publicity, attention and policymaker focus. The Wi-Fi industry needs to shout louder to the media and governments. In summary: I'm very positive about Wi-Fi, especially with the capabilities of mesh, cloud and Wi-Fi6 for the home. But I'm also concerned that the industry isn't being sufficiently ambitious. Yes, in the US there are a lot of positive signs from the FCC about 6GHz The recent European emphasis on Wi-Fi derived DSRC for vehicles is another win. But while those could be big successes, and keep the industry busy for a long time, it's not enough. In industrial use-cases, Wi-Fi faces significant challenges. For public hotspots, some venues' ludicrous sign-up demands are self-defeating and harm overall public perception of the technology. HaLow isn't getting enough attention in the LPWA space. The industry needs to market itself more loudly, more globally, and to a wider audience. It needs to create more space for innovators and developers, with collaboration forums and easier access to documents - and a willingness to extend the brand's goodwill, even to those that aren't doing something fully-standardised. The Wi-Fi industry deserves congratulations on 20 years and $2trillion of economic value. But it needs to double-down on its scope and ambitions, to make sure it will be in strong position at its 40th as well. I will also shortly be publishing a long-form research report on the Consumer Wi-Fi sector, as part of my Network Futures subscription stream with STL Partners (link). It looks at some of the issues raised here in more detail, and focuses in particular on the implications and role of telecom operators and other broadband providers. I'll update this blog post, and also put out details on my Twitter account (link) when it's available. Edge-computing enables applications to access cloud resources with lower latencies, more local control, less load on transport networks and other benefits. Single-Network Telco Edge, where a fixed or mobile operator puts compute resources at its own cell-sites, aggregation points, or fixed-network central offices. Local / Interconnected Datacentre Edge, where an existing or new DC provider puts smaller facilities in tier-2/3 cities or other locations, connected to multiple networks. Federated / Open Edge, where a software player aggregates numerous edge facilities and provides a single mechanism for developers to access them. These are not 100% mutually-exclusive - various hybrids are possible, as well as "private edge" facilities directly owned by enterprises or large cloud providers. They will also interact or integrate with hyperscale-cloud in variety of ways. But there is a major issue. All of these will be impacted by even faster-evolving changes in the ways that users access networks and applications, such as "fallback" from 5G to 4G, or switching to WiFi. In other words, the most relevant "edge" will often move or blur. Superficially "good" edge-compute ideas will be forced to play catch-up to deal with the extra network complexity. (Also - this model excludes the "device edge" - the huge chunk of compute resource held in users' phones, PCs, cars, IoT gateways and other local devices). Note: this is a long post. Get a coffee. A major area of focus for me in 2019 is edge-computing. It’s a topic I’ve covered in various ways in the last two year or so, especially contrasting the telecom industry’s definitions/views of “in-network” edge, with those of enterprise IT and IoT providers. The latter tend to be more focused on “edge datacentres” in “edge markets” [2nd-tier cities] or more-localised still, such as on-premise cloud-connected gateways. I wrote a detailed post in 2018 (link) about computing power consumption and supply, which looked at the future constraints on edge, and whether it could ever really compete with / substitute for hyperscale cloud (spoiler: it can't at an overall level, as it will only have a small % of the total power). I’m speaking at or moderating various edge-related events this year, including four global conferences run by data-centre information and event firm BroadGroup (link). The first one, Edge Congress in Amsterdam, was on 31st January, and followed PTC’19 (link) the week before, which also had a lot of edge-related sessions. Fixed and cable operators want to turn central offices and head-ends into local datacentres - and also house their own virtualised systems too. Many are hybrid fixed/mobile SPs. Long-haul terrestrial and sub-sea fibre providers see opportunities to add new edge data-centre services and locations, e.g. for islands or new national markets. A handful of satellite players are looking at this too. Large data-centre companies are looking to new regional / local markets to differentiate their hosting facilities, reduce long-distance latencies, exploit new subsea fibres and provide space and interconnect to various cloud providers (and telcos). At PTC’19 I heard places like Madrid, Fiji, Johannesburg and Minneapolis described as “edge markets”. Property-type players (eg towerco's) see edge-compute as a way to extend their businesses beyond siting radios or network gear. Startups want to offer micro-DCs to many of the above as pre-built physical units, such as Vapor.io, EdgeMicro and EdgeInfra. Other startups want to offer developers convenient (software-based) ways to exploit diverse edge resources without individual negotiations. This includes both federations, or software tools for application deployment and management. MobiledgeX and Ori are examples here. Enterprises want a mix of localised low-latency cloud options, either shared or owned/controlled by themselves (and perhaps on-site, essentially Server Room 2.0). They need to connect them to hyperscale cloud(s) and internal resources, especially for new IoT, AI, video and mobility use-cases. Network vendors are interested either in pitching edge-oriented network capabilities (eg segment-routing), or directly integrating extra compute resource into network switches/routers. Each of these brings a different definition of edge - but also has a different set of views about networks and access, as well as business models. Set against this wide array of participants, is an even more-diverse range of potential applications being considered. They differ in numerous ways too - exact latency needs (<1ms to 100ms+), mobility requirements (eg handoff between edge sites for moving vehicles), type of compute functions used (CPUs, GPUs, storage etc), users with one or multiple access methods, security (physical or logical) and so on. Single-network vs. Multiple-network access: Can the developer accurately predict or control the connection between user and edge? Or are multiple different connection paths more probable? And are certain networks (eg a tier-1 telco's) large enough to warrant individual edge implementations anyway? For telcos in particular, there is an important subset of edge applications which definitely are single-network and internal, rather than client-facing: running their own VNFs (virtual network functions, security functions, distributed billing/charging, and managing cloud/virtualised radio networks (CRAN/vRAN). They also typically have existing relationships with content delivery networks (CDNs), both in-house and third-party. This "anchor tenant" of on-network, single-telco functions is what is driving bodies like ETSI to link MEC to particular access networks and (largely) individual telcos. Some operators are looking at deploying MEC deep into the network, at individual cell towers or hub sites. Others are looking at less-distributed aggregation tiers, or regional centres. 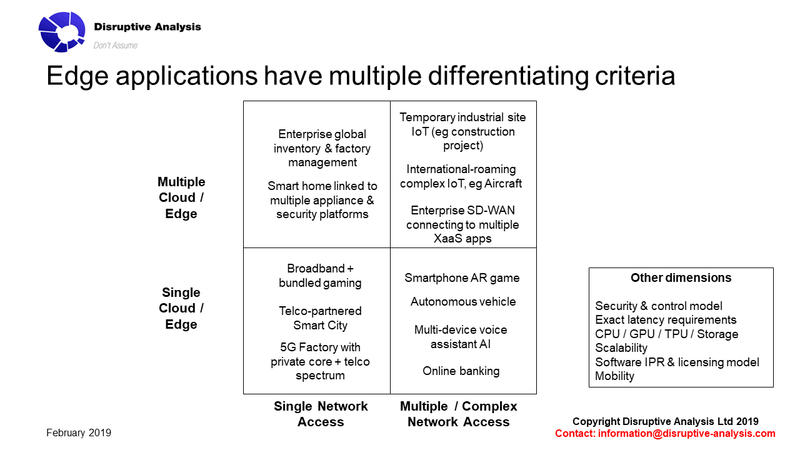 The question is whether this single-network vision fits well with the broader base of edge-oriented applications, especially for IoT and enterprise. How common will single-network access be? The telco edge evolution (whether at region/city-level or down towards cells and broadband-access fibre nodes) is not happening in isolation. A key issue is that wide availability of such edge-cloud service - especially linked to ultra-low-latency 5G networks - will come after the access part of the network gets much more complex. 5G coverage will be very patchy for several years, and for reliable indoor usage perhaps 10 years or more. Users will regularly fall back to 4G or below, particularly when mobile. Users on smartphones will continue to use 3rd-party WiFi in many locations. PC and tablet users, and many domestic IoT devices, will use Wi-Fi almost exclusively. Most fixed-wireless 5G antennas will be outdoor-mounted, connecting to Wi-Fi for in-building coverage. Not all 5G spectrum bands or operator deployments will offer ultra-low latency and may have different approaches to RAN virtualisation. Increasing numbers of devices will support multi-path connections (eg iOS TCP Multipath), or have multiple radios (eg cars). Growing numbers of roaming, neutral-host and MVNO scenarios involving third-party SPs are emerging. These will add latency, extra network paths and other complexities. eSIM growth may enable more rapid network-switching, or multi-MNO MVNOs like Google Fi. Converged operators will want to share compute facilities between their mobile and fixed networks. This means that only very tightly-specified “single-network” edge applications make sense, unless there is a good mechanism for peering and interconnect, for instance with some form of “local breakout”. So for instance, if Telco X operates a smart-city contract connecting municipal vehicles and street lighting, it could offer edge-compute functions, confident that the access paths are well-defined. Similarly it could offer deep in-network CDN functions for its own quad-play streaming, gaming or commerce services. But by contrast, an AR game that developers hope will be played by people globally, on phones & PCs, could connect via every telco, ISP & 3rd-party WiFi connection. It will need to be capable of dealing with multiple, shifting, access networks. An enterprise whose employees use VPN software on their PCs, or whose vehicles have multi-network SIMs for roaming, may have similar concerns. I had a bit of an epiphany while listening to an Equinix presentation at PTC recently. The speaker talked about the “Interconnected Edge”, which I realised is very distinct from this vision of a single-telco edge. Most of the datacentre industry tries to create facilities with multiple telco connections - ideally sitting on as many fibres as possible. This allows many ingress paths from devices/users, and egress paths to XaaS players or other datacentres. (This is not always possible for the most "remote" edges such as Pacific islands, where a single fibre and satellite backup might be the only things available). And even for simple applications / websites, there may be multiple components coming from different servers (ads, storage, streaming, analytics, security etc) so the immediate edge needs to connect to *those* services with the easiest path. Often it’s server-to-server latency that’s more important than server-to-device, so things like peering and “carrier density” (ie lots of fibres into the building) make a big difference. In other words, there are a number of trade-offs here. 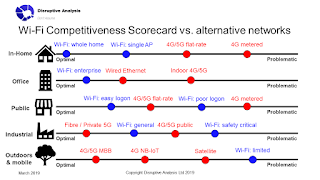 Typically the level of interconnectedness means more distance/latency from each individual access point (as it's further back in the network and may mean data transits a mobile core first), but that is set against flexibility elsewhere in the system. A server sitting underneath a cell-tower, or even in a Wi-Fi access point, will have ultra-low latency. But it will also have low interconnectedness. A security camera might have very fast local image-recognition AI to spot an intruder via edge-compute. But if it needs to match their face against a police database, or cross-check with another camera on a different network, that will take significantly longer. But edge datacentres also face problems - they will typically only be in certain places. This might be fine for individual smart-city applications, or localised "multi-cloud" access, but it still isn't great for multinational companies or the game/content app-developers present in 100 countries. The answer seems to be some form of software edge-federation or edge-broking layer, which can tie together a whole set of different edge resources, and hopefully have intelligence to deal with some of the network-access complexity as well. I've been coming across various companies hoping to take on the role of aggregator, whether that's primarily for federating different telcos' edge networks (eg MobiledgeX), or helping developers deploy to a wider variety of edge-datacentre and other locations (eg Ori). I'm expecting this space to become a lot more complex and nuanced - some will focus on being true "horizontal" exchanges / APIs for multi-edge aggregation. The telco ones will focus on aspects like roaming, combined network+MEC quality of service and so on. Others will probably look to combine edge with SD-WAN for maximum resilence and lowest cost. Yet more - probably including Amazon, Microsoft and other large cloud companies - will instead look to balance between edge vs. centralised cloud for different workloads, using their own partnerships with edge datacentres (perhaps including telcos) and containerisation approaches like Amazon's Greengrass. Lastly, we may see the emergence of "neutral-host" networks of edge facilities, not linked to specific telcos, data-centre providers or fibre owners. These could be "open" collaborations, or even decentralised / blockchain-based approaches. The "magic bullet" here will be the ability to cope with all the network complexities I mentioned above (which drive access paths and thus latencies), plus having a good geographic footprint of locations and interconnections. In a way, this is somewhat similar to the historic CDN model, where Akamai and others grew by placing servers in many ISPs' local networks - but that was more about reducing latency from core-to-edge, rather than device-to-edge, or edge-to-edge. I doubt that this will resolve to a single monopoly player, or even an oligopoly - there are too many variables, dimensions and local issues / constraints. These will overlap, and hybrids and private/public splits will occur as well. My current view remains that power constraints mean that in-network [telco-centric] edge cannot ever realistically account for more than 2% of overall global computing workloads or perhaps 3-5% of public cloud services provision, in volume terms – although pricing & revenue share may be higher for provable lower latencies. Now that is certainly non-trivial, but it’s also not game-changing. 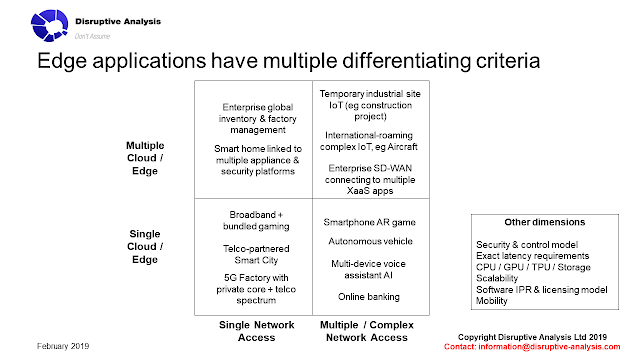 I also expect that in-network edge will be mostly delivered by telcos as wholesale capacity to larger cloud providers, or through edge-aggregation/federation players, rather than as “retail” XaaS sold directly to enterprises or application/IoT developers. I’m also expecting a lot of telco-edge infrastructure to mostly serve fixed-network edge use-cases, not 5G or 4G mobile ones. 5G needs edge, more than edge needs 5G. While there are some early examples of companies deploying mini-datacentres at large cell-tower “hub” sites (eg Vapor.io), other operators are focusing further back in the network, at regional aggregation points, or fixed-operator central offices. It is still very early days, however. The edge datacentre business has a lot of scope to grow, both in terms of networks of micro-datacentres, and in terms of normal-but-small datacentres in tier-2/3/4 cities and towns. However, it too will face complexities relating to multi-access users, and limited footprints across many locations. The biggest winners will be those able to link together multiple standalone edges into a more cohesive and manageable developer proposition, that is both network-aware and cloud-integrated. The multi-network, multi-cloud edge will be tough to manage, but essential for many applications. 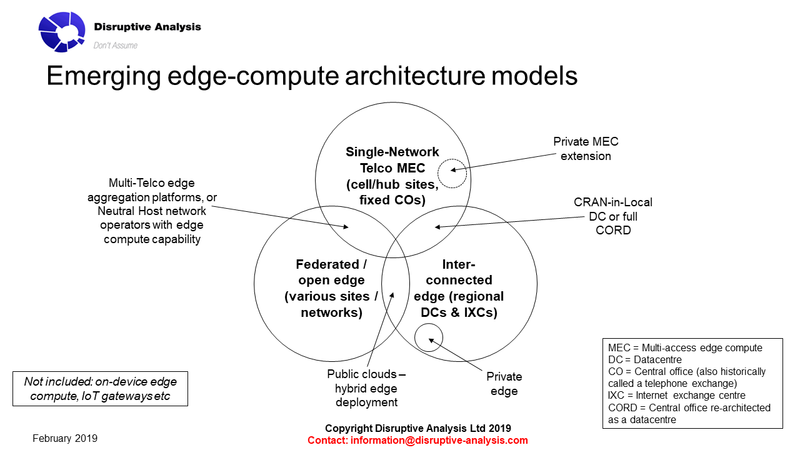 It is doubtful that telco-only edge clouds (solo or federated) can work for the majority of use-cases, although there will be some instances where the tightest latency requirements overlap with the best-defined connectivity models. If you are interested in engaging me for private consulting, presentations, webinars, or white papers, please get in touch via information at disruptive-analysis dot com, or my LinkedIn and Twitter. I will be writing a paper soon on "Edge Computing meets Voice & Video Communications" - get in touch if you are interested in sponsoring it. Please also visit deanbubley.com for more examples of my work and coverage. Dean Bubley is a regular presenter and moderator at conferences, panel debates, roundtables & podcasts, for network operators, technology vendors and event organisers. Disruptive Analysis also offers custom workshops on a wide range of topics. Dean Bubley and other Disruptive Analysis' associates provide customised, on-site workshops for operators, vendors, regulators and investors. Disruptive Analysis and Dean Bubley provide technology vendors, service providers, regulators & investors with custom advisory work and consultancy engagements. Typical projects include business plan validation, market analysis, strategy development and marketing support.